This is a stunning mid century plate / bowl / dish in the ‘Venezia’ decor by Walther Conradt for Gebruder Conradt, West Germany circa 1950’s, form no. ’15/2′. 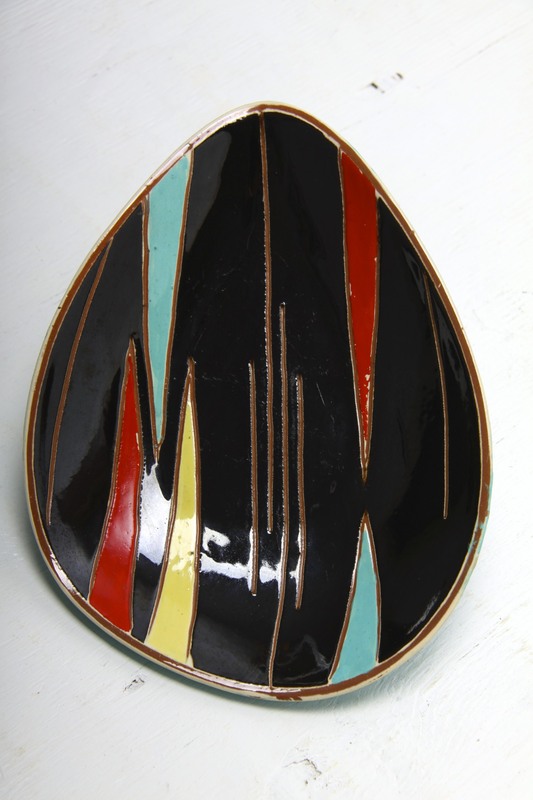 A fantastic design, a shallow bowl / plate with a sloping sides and a rough ovoid shape. With a very graphic decor ‘Venezia’ that is so reminiscent of the 1950’s era. 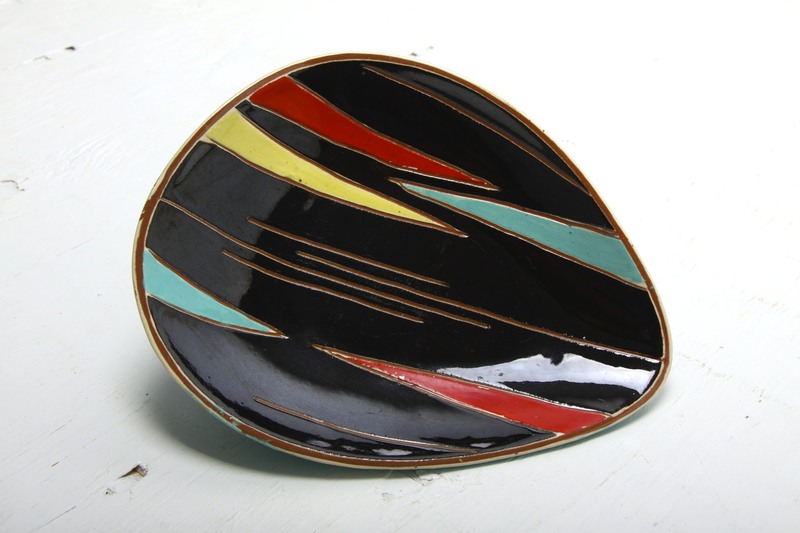 A glossy black base is hand decorated with deep incised lines and filled in with vivid glossy colours in red, yellow and turquoise, geometric, abstract and reflecting trends in Modern art and design in the 1950’s. The underneath is also glossily glazed in turquoise blue. A wonderful rare piece by this smaller lesser known art pottery. Perfect as a decorative display piece, as part of a grouping or to use on a desk, coffee / side table, sideboard or mantelpiece as a trinket / jewellery / pin dish, desk tidy, paperweight etc. Would make a great addition to any collection of West German / studio / art pottery and would complement any retro, vintage, mid century, modernist, minimalist or contemporary styled interior. 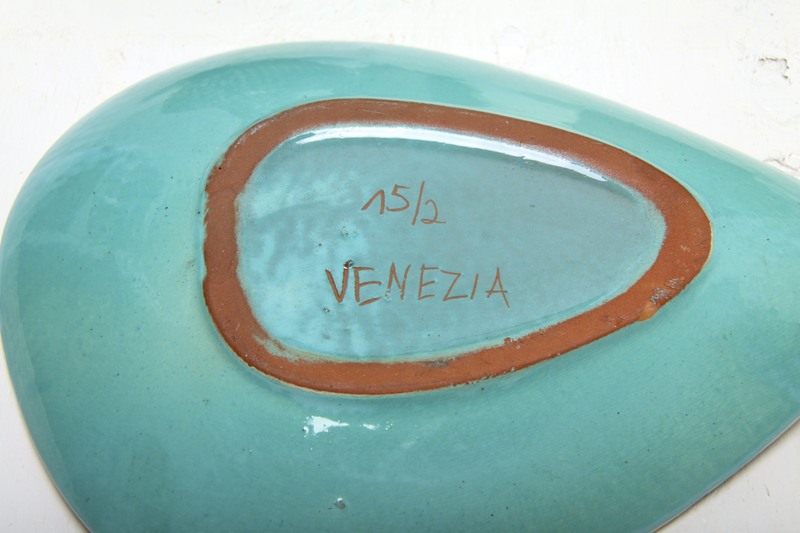 In great condition, no chips or cracks, there is some wear and light scratches to the glossy glazes in the bowl, and a couple of flakes of missing glaze on the rim, reflected in the price, and still displays well. Measures 22 x 17 x 3.5cm / 8.75 x 6.75 x 1.5in.